A jewelry store in North Liberty, Iowa has sure taken the expression "shotgun weddings" seriously. Their October promotion sees them offering a free Remington 870 shotgun with a purchase of an engagement ring worth at least $1,999! The publicity stunt perhaps encourages couples to "jump the gun" and get married? 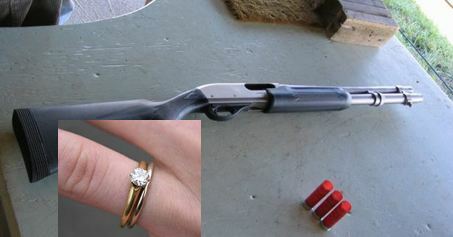 Along the lines of a hunting gun for him and a diamond ring for her? A bit of a lark for sure as the store owner intended. The free media attention didn't hurt either. "Better known as the mother-in-law package!" "When the bride buys the wedding gown, she gets a chainsaw free!" "No. When you buy a hunting license you get a free bridal gown." "A real man would buy a cheaper diamond and a better gun." "OR...take the $2000, buy 3 Remington 870s and stay single." LOL ! Yes sometimes the comments are better reading than the actual article.